Catherine founded ARK Investment Management in January 2014. Prior to ARK, she completed twelve years at AllianceBernstein as Chief Investment Officer of Global Thematic Strategies, with $5 billion in assets under management and superior long term investment returns. 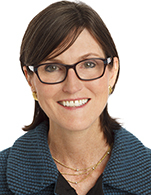 Catherine joined Alliance Capital from Tupelo Capital Management, a hedge fund she co-founded which, in 2000, managed $800 million in global thematic strategies.